With just six months until the PNG Games, the 2005 Churchill Medal winner Scott Prince has been unveiled as official Games Ambassador. Prince notched up 300 National Rugby League games during an illustrious 15-year playing career. The halfback represented Australia, Queensland in State of Origin, as well as the Indigenous All Stars. He played his club football for the Wests Tigers (whom he led to the 2005 Premiership, winning the player of the match award – Clive Churchill Medal), North Queensland Cowboys, the Gold Coast Titans and the Brisbane Broncos. Rugby league is traditionally one of the most popular sports at the PNG Games, where it is run as a 9’s competition. Fifteen teams have confirmed their participation in this year’s Games. Scott Prince’s Ambassadorial role will comprise a number of visits to PNG in the lead-up to the event, as well as attending the Australia-PNG Business Forum in Cairns on May 18th and 19th to promote the Games. He will also feature in television commercials, play a prominent role in the event’s social media strategy and assist key sponsors to achieve objectives. An equally high-profile Papua New Guinean Ambassador to the Games will be announced soon. PNG Games chairman Phil Franklin said: “The PNG Games, ‘Our Games’ are all about sports spirit, sports respect and sports dreams. “Scott Prince’s magnificent career embodies all three of these values. “Sport has a unique ability to unify people from different backgrounds, fostering pride at both national and provincial level. “With such a high-profile Ambassador as Scott Prince, the PNG Games is ideally-placed to achieve its objectives in this area. 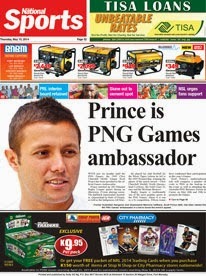 PNG Games CEO Materua Tamarua said: “We welcome Scott Prince as a Games Ambassador. “Scott’s involvement will inspire both teams and athletes to achieve their best results and prepare them for a higher level of competition. “Rugby League is regarded as the national sport of PNG, and the top Australian NRL players are idolised here. “Scott’s appointment will focus the attention of all Papua New Guineans on the Games. “It’s also good news for our commercial partners. “His involvement not only raises the wider profile of the event but in some instances will also add value to their participation. Scott Prince said in response to his involvement with the PNG Games: “I am both honoured and delighted to become an ambassador for this very prestigious PNG event. “I had a close association with the people of PNG during my playing career and know how passionate they are about rugby league, and sport in general.